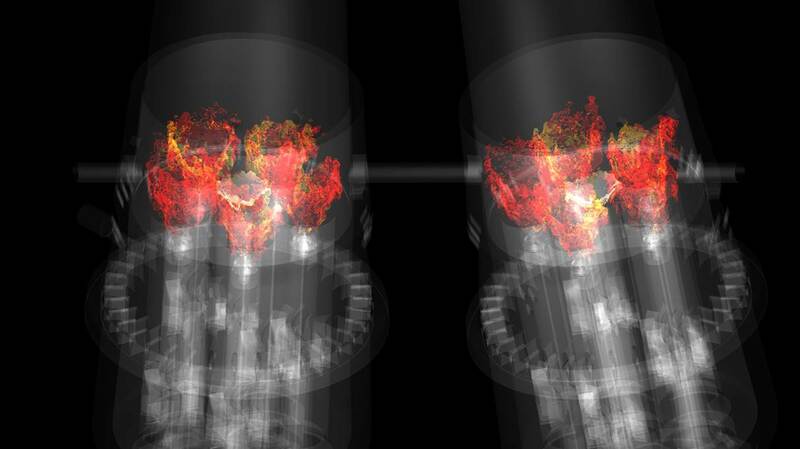 A simulation of combustion within two adjacent gas turbine combustors. GE researchers are incorporating advanced combustion modeling and simulation into product testing after developing a breakthrough methodology on the OLCF’s Titan supercomputer. May 31, 2016 - In the United States, the use of natural gas for electricity generation continues to grow. The driving forces behind this development? A boom in domestic natural gas production, historically low prices, and increased scrutiny over fossil fuels’ carbon emissions. Though coal still accounts for about a third of US electricity generation, utility companies are pivoting to cleaner natural gas to replace decommissioned coal plants. Low-maintenance, high-efficiency gas turbines are playing an important role in this transition, boosting the economic attractiveness of natural gas-derived electricity. General Electric (GE), a world leader in industrial power generation technology and the world’s largest supplier of gas turbines, considers gas-fired power generation a key growth sector of its business and a practical step toward reducing global greenhouse gas emissions. When burned for electricity, natural gas emits half the carbon dioxide that coal does. It also requires fewer environmental controls. GE’s H-class heavy-duty gas turbines are currently the world’s largest and most efficient gas turbines, capable of converting fuel and air into electricity at more than 62 percent power-plant efficiency when matched with a steam turbine generator, a setup known as combined cycle. By comparison, today’s simple cycle power plants (gas turbine generator only) operate with efficiencies ranging between 33 and 44 percent depending on the size and model. GE is constantly searching for ways to improve the performance and overall value of its products. A single percent increase in gas turbine efficiency equates to millions of dollars in saved fuel costs for GE’s customers and tons of carbon dioxide spared from the atmosphere. For a 1 gigawatt power plant, a 1 percent improvement in efficiency saves 17,000 metric tons of carbon dioxide emissions a year, equivalent to removing more than 3,500 vehicles from the road. Applying such an efficiency gain across the US combined-cycle fleet (approximately 200 gigawatts) would save about 3.5 million metric tons of carbon dioxide each year. In 2015, the search for efficiency gains led GE to tackle one of the most complex problems in science and engineering—instabilities in gas turbine combustors. The journey led the company to the Titan supercomputer at the Oak Ridge Leadership Computing Facility (OLCF), a US Department of Energy (DOE) Office of Science User Facility located at DOE’s Oak Ridge National Laboratory. Simultaneously increasing the efficiency and reducing the emissions of natural gas-powered turbines is a delicate balancing act. It requires an intricate understanding of these massive energy-converting machines—their materials, aerodynamics, and heat transfer, as well as how effectively they combust, or burn, fuel. Of all these factors, combustion physics is perhaps the most complex. In an H-class gas turbine, combustion takes place within 6-foot-long chambers at high temperature and pressure. Much like a car engine has multiple cylinders, GE’s H-class turbines possess a ring of 12 or 16 combustors, each capable of burning nearly three tons of fuel and air per minute at firing temperatures exceeding 1,500 degrees Celsius. The extreme conditions make it one of the most difficult processes to test at GE’s gas turbine facility in Greenville, South Carolina. At higher temperatures, gas turbines produce more electricity. They also produce more emissions, such as nitrogen oxides (NOx), a group of reactive gases that are regulated at the state and federal levels. To reduce emissions, GE’s Dry Low NOx combustion technology mixes fuel with air before burning it in the combustor. Such precise burning can lead to other problems, specifically an unstable flame. Inside a combustor, instabilities in the flame can cause deafening acoustic pulsations—essentially noise-induced pressure waves. These pulsations can affect turbine performance. At their worst, they can wear out the machinery in a matter of minutes. For this reason, whenever a new pulsation is detected, understanding its cause and predicting whether it might affect future products becomes a high priority for the design team. In 2014, one such pulsation caught researchers’ attention during a full-scale test of a gas turbine. The test revealed a combustion instability that hadn’t been observed during combustor development testing. The company determined the instability levels were acceptable for sustained operation and would not affect gas turbine performance. But GE researchers wanted to understand its cause, an investigation that could help them predict how the pulsations could manifest in future designs. The company suspected the pulsations stemmed from an interaction between adjacent combustors, but they had no physical test capable of confirming this hypothesis. Because of facility airflow limits, GE is able to test only one combustor at a time. Even if the company could test multiple combustors, access-visibility and camera technology currently limit the researchers’ ability to understand and visualize the causes of high-frequency flame instabilities. So GE placed a bet on high-fidelity modeling and simulation to reveal what the physical tests could not. The company asked its team of computational scientists, led by Yan, to see if it could reproduce the instability virtually using high-performance computers. GE also asked Yan’s team to use the resulting model to determine whether the pulsations might manifest in a new GE engine incorporating DOE-funded technology and due to be tested in late 2015, less than a year away. GE then challenged Yan’s team, in collaboration with the software company Cascade Technologies, to deliver these first-of-a-kind results before the 2015 test to demonstrate a truly predictive capability. But GE faced another hurdle. To meet the challenge time frame, Yan and his team needed computing power that far exceeded GE’s internal capabilities. Leveraging CHARLES’ massively parallel grid generation capabilities—a new software feature developed by Cascade—Yan’s team produced a fine-mesh grid composed of nearly 1 billion cells. Each cell captured microsecond-scale snapshots of the air–fuel mix during turbulent combustion, including particle diffusion, chemical reactions, heat transfer, and energy exchange. The new capability gave GE researchers a clearer picture of the instability and its causes that couldn’t be obtained otherwise. Beyond reproducing the instability, the advanced model allowed the team to slow down, zoom in, and observe combustion physics at the sub-millisecond level, something no empirical method can match. With the computational team’s initial doubts now a distant memory, GE entered a world of new possibilities for evaluating gas turbine engines. Coupled with advancements in other aspects of gas turbine design, Citeno projects the end result will be a full percentage-point gain in efficiency. This is important to GE’s and DOE’s goal to produce a combined-cycle power plant that operates at 65 percent efficiency, a leap that translates to billions of dollars a year in fuel savings for customers. A 1 percent efficiency gain across the US combined-cycle fleet is estimated to save more than $11 billion in fuel over the next 20 years. Building on its success using Titan, GE is continuing to develop its combustion simulation capabilities under a 2016 allocation awarded through the DOE Office of Advanced Scientific Computing Research (ASCR) Leadership Computing Challenge, or ALCC, program. As part of the project, GE’s vendor partner Cascade is continuing to enhance its CHARLES code so that it can take advantage of Titan’s GPU accelerators.